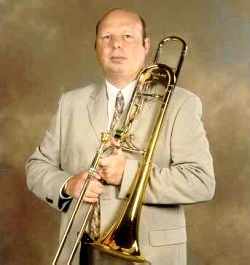 Philip Biggs and Richard Franklin have announced that Chris Jeans, Artistic Music Director of the award winning Youth Brass 2000 and principal trombonist of the Virtuosi GUS Band will be the recipient of this year’s Masters Dedicated Service Award. Trombone virtuoso Matthew Gee, principal trombone of the Royal Philharmonic Orchestra, former student and past member of the award winning Youth Brass 2000 is pleased to accept the honour of presenting the Award to his former teacher Chris Jeans for his 37 years of dedicated championship banding and over 30 years of Youth band service in the UK and Worldwide. One of the banding world’s most respected and successful trombone players, Chris Jeans recently released his latest CD recording to critical acclaim, whilst as an educator he has been the Brass Co-ordinator and Musical Director of the School Symphonic Wind Band and Brass Band at Leicester Grammar School for more than 20 years. His inspired leadership of Youth Brass 2000 now spans over two decades, leading them to numerous contest and concert successes. The Award will be presented to Chris at the conclusion of the All England Masters International Championship which takes place at the Lighthouse Theatre, Kettering on Sunday 26th May. Tickets for both the Championship and Gala Concert are available from the Lighthouse Theatre Box Office, telephone 01536 414141.